Kate qualified in 2013 from peninsula dental school with a BDS Honours, following on from a degree in Physiotherapy. 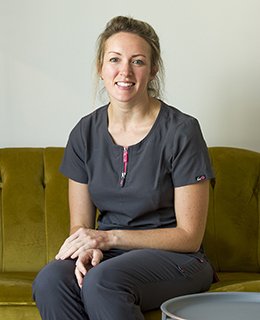 She did her foundation training in Tavistock before joining Wadebridge Dental in 2014. Kate covers all aspects of general dental care but has a particular interest in prosthetic dentistry – crowns, veneers, bridges and dentures. She also loves to enhance people’s smiles and self confidence by lightening teeth and improving the aesthetics of front teeth. Kate regularly provides teeth straightening (Invisalign, Fastbraces, Six month smiles, Inman Aligner) and Smile Makeovers as well as Facial Aesthetics (botox, dermal fillers). Outside of work Kate has a busy life being very involved in horses and the sport of eventing. She has 2 horses and regularly competes all over the country.